Finally a knitting loom patterns ebook for the loom knitter with easy patterns for more than just hats. This knitting loom patterns ebook is filled with patterns for sweaters for the baby, toddler and small dog. There are adorable booties, super warm slippers, popular doll clothes and more. All items are made on the easy to find inexpensive, Knifty Knitter Looms. I am always disappointed by the sheer lack of patterns for loom knitting. Loom knitting is just perfect for a quick project and/or for people that just can't get a handle on knitting with two needles. 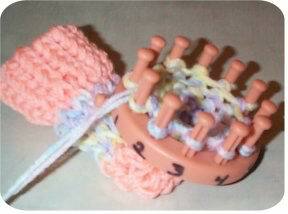 Loom knitting eliminates the needles and makes knitting quick as a breeze. No machine needed, the looms are very portable and handy for just about anyplace you want to take them. So I sat down and proceeded to work on some patterns for my family and friends. When people started asking me about the patterns and how they could get them. I decided there was a need for this book. It took some time and effort but I believe it is well worth it. You can buy expensive looms or make one yourself. If your pegs are spaced correctly you will be able to use any pattern in this book. The price or make of the loom makes no difference in the patterns. Many will try to sell you some expensive loom for your knitting but that is not necessary. Of course if you want the expensive looms and can afford them there is no problem with that either. You will find patterns for Christmas gifts, baby showers and just to say I love you. 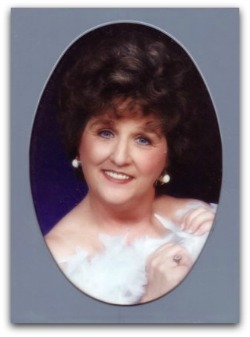 My family loves the slippers, my dogs are toasty warm in the sweaters and the granddaughters love the doll clothes. There are baby booties, slippers for toddlers, hats for friends and lets not forget Dads cold feet. 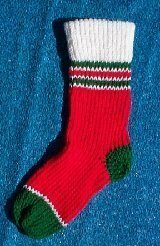 Adult Slippers, completely lined and knit in one piece. These slippers are thick and warm with a complete lining. 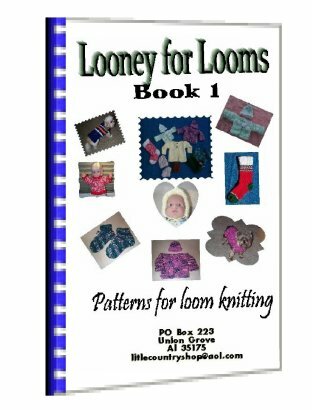 This is just one of the many patterns you will enjoy in "Looney for Looms"
Loom knitting is quick and easy, so grab your copy now and be ready for the holidays. All this for a very reasonable price. For the beginner or the experienced, have fun and create. You don't have to even wait days for delivery. Now you can download it upon payment. You can start knitting in the next few minutes. This book is a must for all loom knitters. Don't wait, get your copy today and be ready for the next holiday or occasion that requires a really special gift. This book is the perfect gift for yourself or you loom knitting friend. Download your copy now, don't waste another minute looking for patterns that aren't out there. Get it now and have all your gifts made by Christmas. "This is more than you promised. Love it the patterns are wonderful"